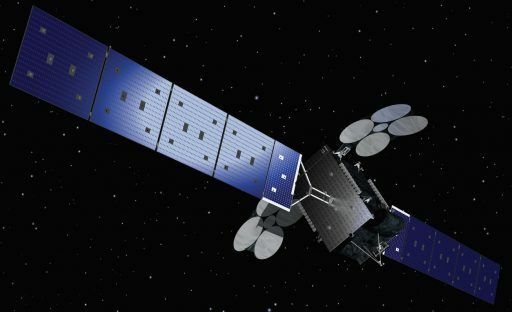 Al Yah 3 is a commercial communications satellite built by Orbital ATK and operated by the Al Yah Satellite Communications Company (Yahsat) to deliver broadband Internet and data networking to Africa and Brazil, expanding the company’s commercial high-throughput Ka-Band coverage to twenty new markets. Using Orbital’s powerful GEOStar-3 satellite platform, Al Yah 3 delivers over 53 high-power Ka-Band user beams to provide high-speed data services for end-user applications as well as IP backhaul for telecommunications service providers. Founded in 2007 and headquartered in the United Arab Emirates, Yahsat is a wholly owned subsidiary of Mubadala Development Company, a strategic investment company run by the government of Abu Dhabi. Yahsat operates a fleet of satellites to deliver voice, data, video and Internet services for broadcast and Internet providers as well as VSAT users in the private and government sectors. 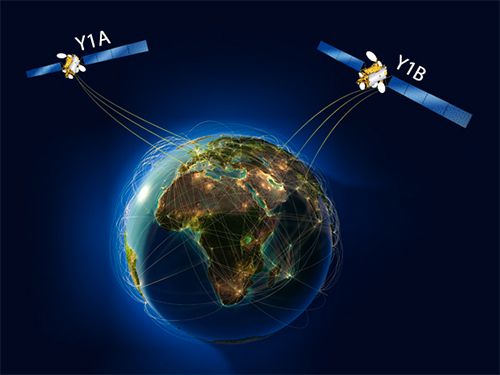 The company’s satellites cover South West Asia, the Middle East, Africa and Eastern Europe, with expansion into South American markets through the addition of Al Yah 3. 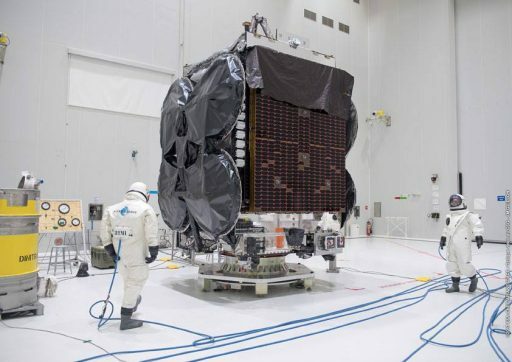 The company’s first satellite, Al Yah 1, was built by Airbus Defence and Space (then EADS Astrium) and Thales Alenia and launched atop an Ariane 5 rocket in April 2011 to deliver a variety of telecommunications services via a hybrid payload comprising C- and Ku-Band transponders for civilian use in broadcasting and data services and a secure Ka-Band payload for use by the UAE Armed Forces, YahSat’s first government customer. 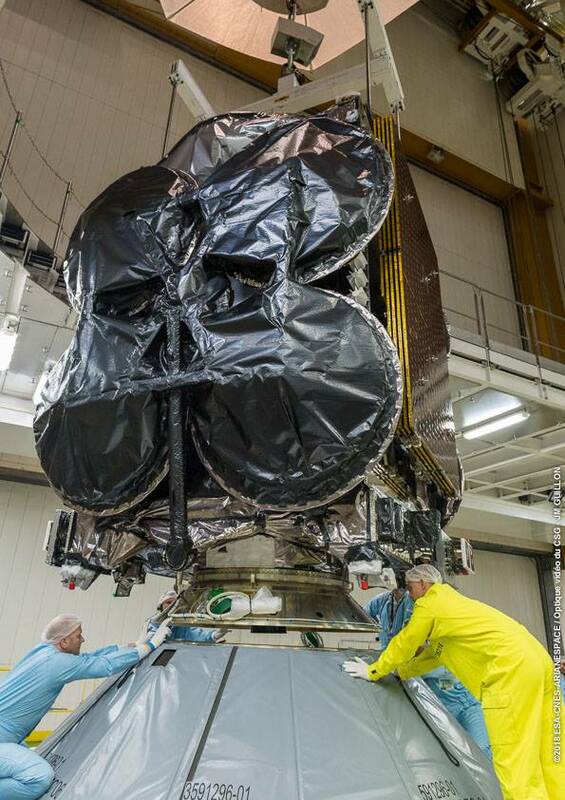 Al Yah 2 was built by the same industry consortium and lifted off in April 2012 atop a Proton rocket, carrying a Ku-Band payload for direct-to-home television distribution and a secure Ka-Band communications package for military and government use. For the Al Yah 3 high-throughput satellite, Yahsat stepped away from the European industry consortium that built its first two satellites and turned toward Virginia-based Orbital ATK and their new GEOStar-3 high-performance satellite platform, marking the first flight of the hybrid satellite bus, developed as a modern-day satellite platform leveraging the advantages of electric propulsion to create a lightweight platform capable of supporting high-power communications payloads with particular focus on the growing high-throughput market. Al Yah 3 measures 5.18 x 3.35 x 2.87 meters in dimensions when launching which allows it to fly in the lower passenger berth of the Ariane 5 launch vehicle. The 3,795-Kilogram Al Yah 3 satellite carries a 7.5-Kilowatt high-throughput Ka-Band payload for Fixed Satellite Services (FSS) communications provided via 53 operational Ka-Band user beams (+5 spares) split between coverage zones in Africa and Brazil. Eight payload reflectors on deployable pallets direct the user beams to their appropriate coverage zones on the two continents and four operational gateway beams connect the user beams to ground terminals interfacing with terrestrial networks to route communications to their desired destination. Al Yah 3’s powerful payload package delivers two-way communications needed for high-speed Internet, data routing to end-user applications and corporate networks, as well as IP backhaul for telecommunications service providers. 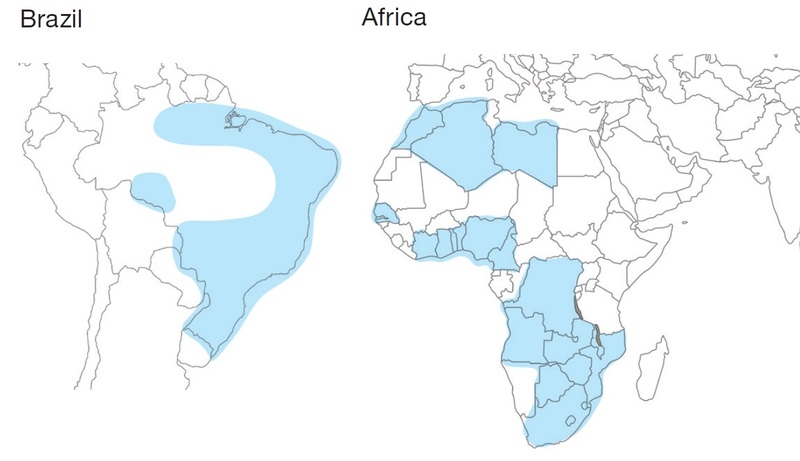 The satellite’s coverage zones extend YahSat’s Ka-Band distribution to 20 new markets, reaching over 95% of Brazil’s population and around 60% of Africa’s population (Morocco, Algeria, Libya, Senegal, Ivory Coast, Ghana, Togo, Benin, Nigeria, Cameroon, DC Congo, Angola, Zambia, Botswana, Zimbabwe, Mozambique, South Africa, Lesotho, and Swaziland). 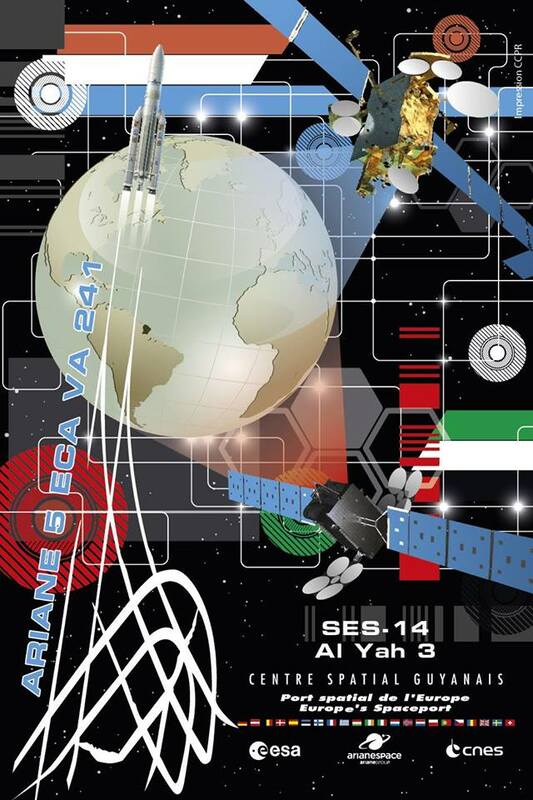 Built for a mission of at least 15 years, Al Yah 3 will operate from 20° West in Geostationary Orbit, a position over the Atlantic Ocean from where the communications payload can cover Africa and South America. 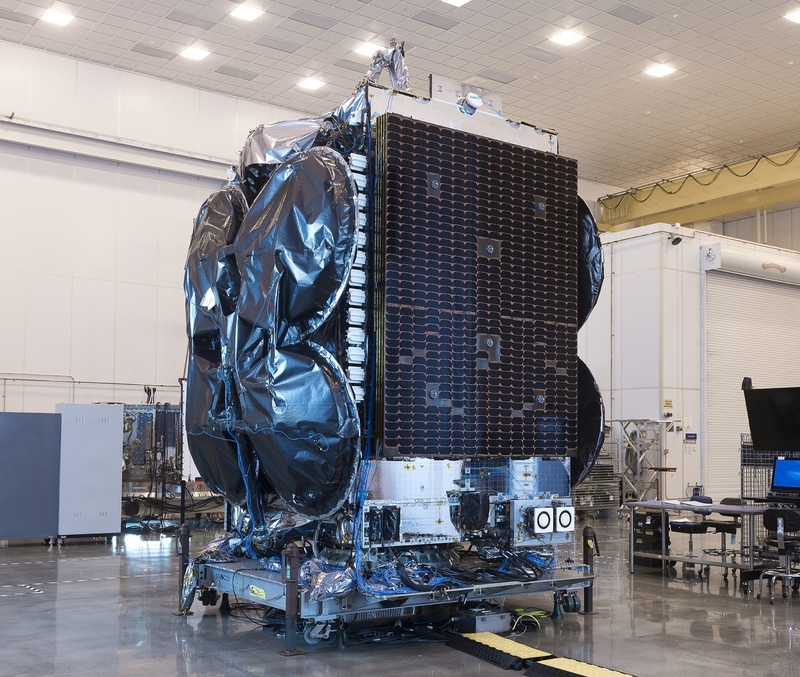 Although the first of its kind, the GEOStar-3-based satellite is expected to meet its desired mission duration through the use of robust and redundant onboard systems with flight heritage from previous programs. The GEOStar-3 satellite platform represents Orbital ATK’s largest satellite bus to date, leveraging experience from the company’s GEOStar-2 platform series and catering to an emerging class of satellites aiming for high-performance while keeping mass and volume low – requiring innovations in the area of power generation and electric propulsion. Orbital ATK’s GEOStar-2 product line has flown successfully on nearly three dozen missions since 2002 with satellites in the 1.9 to 3.3-metric ton class and a payload power of up to 5.0 Kilowatts. The company cites the prime advantage of the GEOStar-2 in its small size yet high performance characteristics, allowing it to be launched cost-effectively as lower-berth passenger on Europe’s Ariane 5 rocket or slots with comparable performance on other vehicles. The GEOStar-3 satellite platform relies on robust heritage from the smaller GEOStar-2 with performance improvements in critical areas like power generation, structure and hybrid propulsion to create a low-mass platform with a high payload capacity, both in terms of mass and power. GEOStar-3 has been designed for satellites in the 3.5 to 4.5-metric-ton class and an end-of-life power up to 8 Kilowatts. To satisfy the power demands of high-powered communications payloads, GEOStar-3 implements a number of enhancements within its Electrical Power System including an increase in solar array size and power output via Ultra-Triple-Junction Gallium-Arsenide solar cells and increased capacity of the vehicle’s Li-Ion batteries. Retained from the previous generation of Orbital ATK platforms is the 36-Volt power architecture that has proven very effective with a 100% success rate. Structural improvements through the use of composite materials led to a decrease in bus dry mass while creating an optimal load-carrying capability and propellant tank accommodation. The satellite platform structure also allows for tandem launches and GEOStar-3 has been optimized for use as a hybrid satellite bus carrying conventional bi-propellant main and attitude thrusters for orbit-raising operations while Stationkeeping is either handled by the heritage ImpEHTs pulsed plasma thrusters or a new type of flight-proven Electric Propulsion System with increased performance characteristics (see below). The GEOStar-3 bus can accommodate payloads up to 800 Kilograms and 8,000 Watts. Its thermal management system can support up to 72 radiatively-cooled Traveling Wave Tube Amplifiers or a larger number of TWTA’s employing a combination of radiative and conductive cooling. GEOStar-3’s scalable thermal control system can dissipate up to 4,800 Watts of heat, allowing it to host high-power communications packages. Leveraging decades of experience in space-based deployables, GEOStar-3 can support a variety of deployable reflectors and nadir-facing antenna configurations. The platform can also host custom-fabricated appendages and various hosted payloads to broaden its operational use beyond the scope of communication missions. 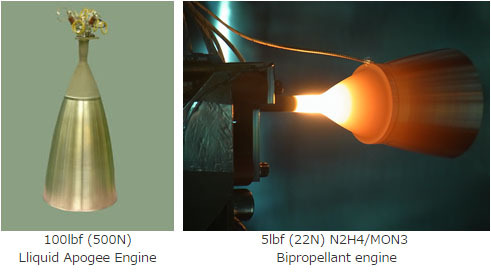 The hybrid propulsion concept employed by GEOStar-3 relies on a liquid-fueled bi-propellant main engine for orbit transfer from the satellite’s initial injection orbit into a near-geostationary orbit with hydrazine monopropellant thrusters in use for attitude control before and during main engine burns. The Xenon Hall Current Thrusters of the satellite are employed for ‘orbit topping’ – transitioning from the near-GEO orbit into a stable GEO at the satellite’s desired position. Stationkeeping will primarily use the electric propulsion system, though the thrusters are available to use propellant reserves and extend the satellite’s stationkeeping capability. Al Yah 3 employs an IHI BT-4 main engine which has been used abundantly by Orbital ATK on the company’s geostationary satellites as well as the prime maneuvering thruster of the Cygnus cargo spacecraft servicing the International Space Station. BT-4 was developed by IHI Aerospace, Japan and has a dry mass of 4 kilograms and a length of 0.65 meters. The engine provides 450 Newtons of thrust using Monomethylhydrazine fuel and Nitrogen Tetroxide oxidizer. The attitude control thrusters rely on the catalytic decomposition of Hydrazine over a metallic catalyst bed into gaseous reaction products expelled to create thrust. 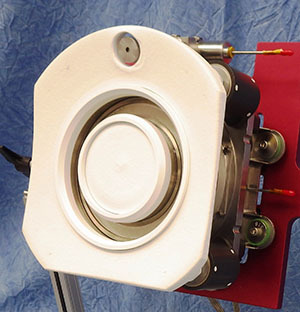 The satellite hosts four 4-Kilowatt-class XR-5 Xenon Hall Current Thrusters developed and built by Aerojet Rocketdyne. XR-5 has successfully flown on the U.S. Air Force AEHF communications satellites and a modernized version, XR-5A, successfully completed testing on the fourth mission of the X-37B Orbital Test Vehicle. XR-5 was developed in the 2000s and has operated extensively in orbit at power levels of 3.0 to 4.5 Kilowatts at both 300 V and 400 V. Using zero-erosion technology, the XR-5 has been demonstrated to support over 10,000 hours of operation and over 7,000 starts. Its operational flexibility for power and voltage allows an optimization between mass and cost savings by allowing low-voltage, high-thrust operation of the thruster during orbit topping to accelerate the in-service date for the satellite while the high-voltage, high-impulse setting allows for efficient and prolonged stationkeeping over extended mission durations to allow satellites to drive in revenue beyond their expected service lives. At their baseline setting, each XR-5 thruster delivers 280 Millinewtons of thrust at a specific impulse of 1,815 seconds. Through extensive ground testing, the performance map of the XR-5 could be broadened to power settings between 1 and 5.5 Kilowatts, allowing for high-impulse operation up to an Isp of 2,700 seconds. The total impulse expected for the thruster’s service life and a throughput of 450 Kilograms of Xenon is in excess of 8 MN-s.